The prospect of six more years of President Vladimir Putin has been met by Russian artists with varying degrees of desperation, exaltation and resignation, reflecting the ideological divisions of the country’s cultural scene. Putin announced his candidacy for the 2018 presidential elections last month at a youth rally in Moscow where he coyly asked the crowd if they wanted him to run; they responded with rapturous cheers. Within hours he was at a car factory being entreated by workers to seek re-election. If he does win, which seems almost certain, his next term will bring his years in office as president to a total of 20 in addition to the four-and-a-half he served as prime minister. 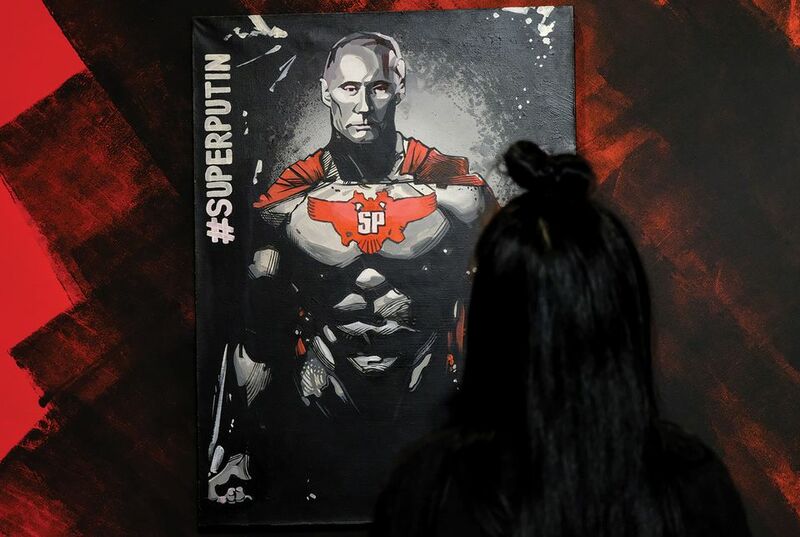 Anticipating the inevitable, Alexander Donskoy, a former mayor of Arkhangelsk who faced criminal investigation on charges including abuse of office and who then went on to open a museum of erotica and become a contemporary artist, has sponsored an exhibition called Superputin at Moscow’s Ultra Modern Art Museum. The display includes sardonic paintings, sculptures and comics depicting Putin as Santa Claus, showing him petting animals and performing heroic feats (until 15 January). In search of additional funds—and publicity—Donskoy launched a crowdfunding initiative to help pay for the exhibition, but this drew only three donations totalling 200 rubles ($3). In an echo of Soviet times, realist artists are openly glorifying Kremlin policy. An exhibition of monumental paintings showing Russian troops saving Syria from ruin by Vassily Nesterenko—entitled Syrian Land—closed in Moscow last month. While pro-regime artists are given encouragement, liberals continue to face harassment and worse. The theatre director Kirill Serebrennikov is currently facing prosecution on fraud charges. His staging of Nureyev, a ballet about the legendary dancer who defected from the Soviet Union, premiered at the Bolshoi Theatre in Moscow in December. However, Serebrennikov was not there to see it: he was under house arrest. Only artists who have left Russia can be more openly critical of Putin. Marat Guelman, the art impresario who moved to Montenegro in 2015, wrote in a series of posts on Facebook that Putin’s announcement that he would run for president once more confirmed his decision to leave the country. “To have nothing to do with this government, to be a ‘Russian curator under a neutral flag’—that is my identity for the coming six years,” he said in reference to the International Olympic Committee’s ruling that Russian athletes can only participate in the Winter Olympics this year if they are not officially representing their country.